Blog Hop Wednesday is here and my this Wednesday my blog partner is Prathima of Prat’s Corner. She has some amazing repertoire of recipes which are begging a reader to try. Radhika has made me go through this dilemma every fortnight. There are just too amazing bloggers there who enjoy cooking & eating as much as I do if not more. :D I love being a part of Blog Hop. Coming back to Prathima, I chose Mint & Choco-chip Ice-cream which she had made for her mother. I felt that this was something I have never done before & the recipe was easy enough for someone like me to replicate. However, I did make slight changes – I replaced choco-chips with tender coconut & added vanilla essence for just the hint of flavor. Also I doubled the recipe & increased tender coconut as per my needs. I also added coconut before blending rather than after blending as it would give a uniform taste of coconut in the ice-cream. But if one is using choco-chips then they have to be added later. Drink a coconut. Ask the vendor to remove & give you ‘malai’ or tender flesh of coconut. Bring it home, chop it into fine pieces. :) I loved writing this step. Dissolve cornflour in 50 ml milk & set aside. Boil the remaining milk in a thick bottom pan. When it is boiled, add cornflour-milk slowly, stirring continuously. Now add sugar & mix till uniform. Simmer for another 4-5 mins, continue stirring. Remove from flame and allow to cool completely. When cool, add the cream, vanilla essence, peppermint & tender coconut. Mix. Transfer to a shallow container & freeze till slushy – about 7-8 hours. 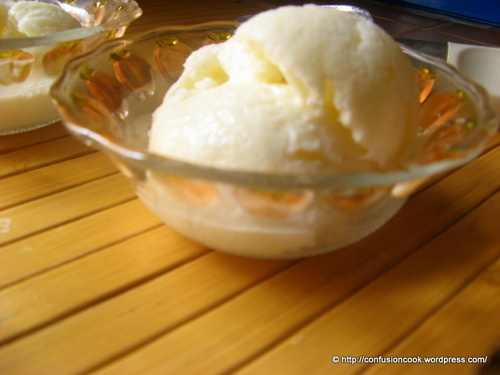 Divide the ice-cream in 2 batches & churn each batch separately in a blender till smooth. Transfer back to the shallow container. Serve chilled with wafers or in a waffle cone. 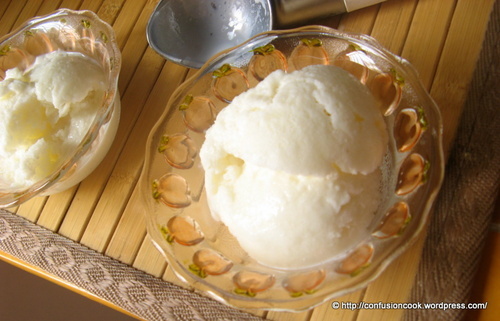 The ice-cream was very good, with just a little hint of refreshing peppermint complimenting tender coconut beautifully. Also, it had perfect sweetness – just the way we like it. Though little ice-crystals were formed, the reason for which I have to do some R&D on, the ice-cream was still a hit. If any of you are aware why it happened & how to avoid in future please suggest. Our friends had their 3rd Anniversary last week & we enjoyed this ice-cream with them to celebrate. Also she loves tender coconut so it became a perfect gift for them from us.